POSTCARD #156: Chiang Mai: I arrive in the hospital waiting area with the pain, this intrusive stabbing pain in the head and neck, postherpetic neuralgia, a permanent headache; sounds worse than it is – could be I’m getting used to it. There’s a flat screen TV and a coffee place, maybe I should order something? I have the iPhone to fiddle with, get busy with that… not interesting. Okay so try thinking about something else, but at this particular moment, there’s nothing else to think about – only the pain all around the right side of my head and neck. Think of something… thought itself is a free app I have the option to download on the mind/body device (namarupa) but even though I don’t have to download it, some of it seems to be here already, appears involuntarily. I hear the thoughts, the ‘voice’ inside the machine shouting out: Hey! the pain is happening to ‘me!’ It’s not happening to you, or them, or him, or her, it’s happening to me! The pain is ‘mine’, I am ‘possessed’ by it. Everything I love and hate, everything I love to hate – it belongs to ‘me’… it’s ‘my’ enemy! With the pain swirling like a dense, dark cloud around my head and neck, I step carefully over to the TV that nobody is watching. There’s a remote, so I can flip through the channels and see where that gets me. Bend down to get the remote and the storm of pain happening to ‘me’ is there again, overwhelms everything, too much, for a moment I give way to it… and it’s then I notice there’s a space of somehow being detached from the pain, it’s something that’s not felt anymore, enough of an easing back from it to see the pain is an appearance, like everything else. Sit down in front of the TV. Focus on the remote, press the buttons… so many channels. Some channels I recognise, then up into higher and higher numbers; places I’ve never been in before. Almost all of the channels are hazy or white-noise then I break through into a place that’s loud, clear and colourful. A Korean game-show, dubbed in Thai. It’s as if the storm of pain is all around but outside of this curious place – I’m safe in here. The scene unfolds, all the characters are lipsticked and painted with cosmetics like grotesque clowns, with amazing hair and impossible teeth, an embodiment of consciousness deeply obscured in layers of ‘self’. Man created God in his own image; a mirror reflection of the ego. POSTCARD♯06: Bangkok: Standing outside the house in the shade of a large tree, waiting for the taxi to the airport. The brightness of the sun is tremendous, colours are vivid, the world is a high resolution Photoshop enhancement. After the eye surgery I feel like a nocturnal creature, squinting in the daylight, a quiet presence behind sunglasses. I have an attachment to darkness, I’d like it to be dark, dull and rainy today but instead it feels like I’m in a television studio. The light penetrates everything. There are no real seasons in Thailand, no markers in the calendar to say where we are in the annual cycle. The weather is the same every day. Night comes at 6pm, instant darkness, then at 6am, instant daylight and each day is pretty much like the one before. The days become weeks, weeks become months, months become years. The whole thing is just one very long, continuous day, and night is the blink of an eye. Time disappears, people are startled to discover they have aged… wake up one day to discover they’re old – life has gone. Rip Van Winkle fell asleep and woke up with a very long beard. The story is based on an Orkney folktale about an inebriated fiddler, late one night on his way home, hears some wonderful music and discovers a group of magical beings dancing in a circle. He plays his fiddle with them for a while and continues on his way home. When he arrives he discovers fifty years have passed; people have died, his daughter is middle-aged, her children are grown up. We don’t see the true nature of the world. Reality is thought to be what is out ‘there’, perceptions based on received sensory data input: what we see, hear, touch, taste, smell – and what we ‘think’ it is. What we recognize as a particular colour, is seen by an insect as ultra-violet, by a snake as infra-red. Who are we to say our view of the world is exactly what it is? The ground appears to be solid, terra firma even though the planet is spinning around, hurtling through outer space at thousands of miles an hour. Things are not what they seem to be. A bright pink and white taxi approaches the house, enters the driveway and fills my vision. Bags inside, door slam, reverse out and we’re gone. 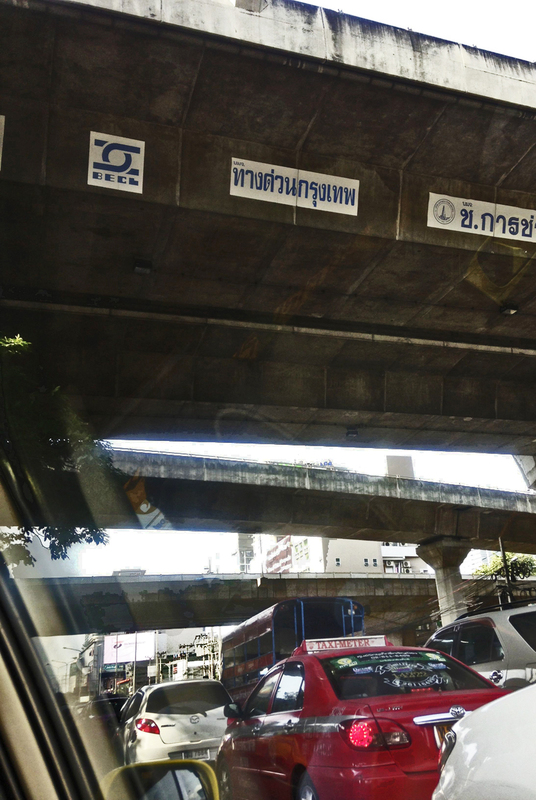 Bangkok: Falling out of the sky, jet-lagged and inert. A 12-hour flight from London; they gave me an upgrade to business class, nice. More space, better everything and a larger seat. Able to stretch out in the prone position, yes but also a huge selection of videos so I watched movies for 12 hours and no sleep. Now in a state of hypnosis here at the house, lying on the sofa in another time zone. Early morning in Bangkok and I’m watching the FOX channel. There’s only one English language channel on TV in this place so it simplifies things: NCIS, Bones, The Bridge and others. The stories merge into one all-inclusive narrative, a complex and improbable plot. Good-looking actors in expensive cosmetics play characters that migrate from other crime series into this one, the central story, all roads lead to one end, catching the bad guy, variations on a crime scene theme. The pace of it is intense, camera shots hold for about 3 seconds then change. Background audio has a percussive, mechanical sound then it’ll switch to something calm; a picture of domestic reality, beautiful interior, elegant lighting, lovely fabrics – I wish I had a room like that. Slow piano notes played meaningfully, like steps taken through the memory of something that happened once. I’m lulled into acceptance; the way it unfolds is the way it is. I become the story. Suvarnabhumi airport: 05.30 hours, enter the check-in hall, and I’m one in a great sea of people, all pushing trolleys with luggage… amazing; takes my breath away. It seems to be divided equally over two check-in areas: H on the left, and J on the right. Quick decision, go right – I’m at the end of the line, I’m the last… I’ll miss the plane! Everybody is stumbling along, dismayed: how could it be like this? The slow-shuffle, steadily moving down a very long, snake-like line, doubling back on itself, for five rows – looks like about 100 persons in each line, 500 people in front? The paranoia of individuals acting-out in wild queue-jumping behaviour arises (protecting my place in the line…) then that ceases. Relax, watch the breath, and observe reactions: a narrative of events in the mind. Seeing it happening as I’m going along; emotions rising and falling like sailing over these large waves on the sea. Stormy thoughts rise up and activate the red light: stop thinking! There’s the experience of intense contraction in the mind and immediately there’s the insight into letting go of it, drop that one now. Back to watching the breath again. Airline staff serves the meal, feeding the five hundred – sounds biblical. Through the window, sky, clouds, and the surface of the planet. It makes me feel like a tiny speck of life, a microscopic cell. The body is allotted a space in a chair moulded to fit, takes up volume and weight. The body composed of the four elements: earth, water, fire and air, is something like a car battery, positive and negative poles, chemical reactions, and the mind is the energy that comes from that, the nama-rupa compound. Who ‘I’ am is not important, and the idea that it is ‘something’ (it is ‘me’) is a concept, a digital display that comes with the software. The whole thing is more like ‘process’, a connectedness on every level. Origin unknown, just believing in an external creator doesn’t seem to be it – the only reason that comes to mind is my own Christian conditioning as a child. I need to investigate this. The metaphor helps me to transcend my existing situation, figures of speech; other than that it’s all speculative conjecture. How can I see it in any other way? Anything else beyond this present conscious state must be so remote from what I presently know that none of the rules I’m familiar with apply. I’m in awe – I simply don’t know…. Chiang Mai: Going to the airport in a tuktuk through a network of small streets. It’s probably a shortcut, but all these speed bumps? I’m feeling a bit queezy, seasickness must be like this. Or is it just that I’m surprised to be rolling up and over joyful little mountains. First the front wheel then the back wheels (three-wheeled vehicle), again and again; overkill on speed bumps. Sure enough it makes you feel giddy, all the ups and downs and I don’t ‘like’ it much but my wanting it to not be like this is making it into an issue. It’s a control thing, it’s about the so-called ‘me’. ‘I’ am the problem because, in fact, there’s nothing here; a body-mind mechanism that can process and transform data, the Five Khandas, that’s all. Nobody at home, no ‘self’ anatta, no-thingness. Only namarupa responses, natural processes and the feeling of ‘I’, ‘me’ and ‘mine’ arises due to the curious nature of sensory experience – this game of hide-and-seek, and the flip-side of concealment is revelation? Maybe so but first things first, at this point in time I’m having an acute bout of speed-bump nausea and the small discomfort of it is in the centre of consciousness. Some basic sense informs me it’s a mistake to try to reject it or think it shouldn’t be there, I’d be better to get around to accepting it; the 1st Noble Truth, a deep acceptance that causes the ‘holding’ to ease off and there’s definitely something about this teaching; if you can understand it, the suffering disappears. The first time I came to see it, all kinds of habitual ‘holding’ that had bothered me for years just fell away. Gratitude to the Ajahns in Thailand for their guidance. It seems to me now though, there’s still something I’m not getting here? I’d been thinking that all the Theravadin masters are teaching, in their tremendous intensity and detail, is mindfulness about what you’re doing and the skill of letting-go. Beyond that there’s nothing said except the reference to it as the ‘deathless’. Non-duality teachers talk about pure consciousness in the sense of something tangible; they’re saying there’s something ‘there’. The ‘I’ that is arising is the ‘I’ of everything. Theravadin Buddhists, on the other hand, are saying it can’t be like that; it’s emptiness – if you think there’s something there, it’s a handle to hold on to and the whole thing is about letting go, not holding on. So, today I’m thinking it’s helpful to have the stability of that ‘thing’ and I’m holding on; I want there to be something in that space, a sense of familiarity, it’s a known place and the sick feeling can be happening in an awareness that’s much larger than the confines of the cramped ‘self’. No little ‘me’ having to cope with it, the speed-bump nausea is not ‘mine’, no ownership, it’s not personal.’ It’s about learning how to be a totally open presence, aware of the way the ‘self’ perpetuates itself – on all levels and not buying into that. A short while after that, thankfully, we get out of the narrow streets, small intersections, and onto the open space of a smooth, flat, easy highway in one long straight route across to the airport….